NEW YORK (CNNMoney.com) -- The Gulf oil disaster isn't the only time a blowout preventer failed to stop an explosion. On June 3, a natural gas well in central Pennsylvania erupted despite the fact that it too was outfitted with a blowout preventer, spewing gas 75 feet into the air for 16 hours before it was brought under control. Until recently, these so-called BOPs were touted by the industry for their ability to make dangerous drilling operations safer, or at least less dangerous. But although failures are rare, their consequences can be catastrophic. "BP said it relied on its blowout preventer [to try and prevent the disaster,]" Rep. Henry Waxman, D-Calif., said in opening comments Wednesday at a House Energy and Commerce subcommittee hearing. "We know that blowout preventers are not foolproof, not even close." Lawmakers convened to discuss the Blowout Prevention Act of 2010. The bill would require offshore drilling companies to demonstrate that their blowout preventers actually work -- and that they have an oil spill response plan just in case they don't. "Most of the time that a BOP is activated is to test it, to make sure that it's functioning normally," said Geoff Kieburtz, oil field service analyst for Weeden & Co. "BOPs are a standard piece of a drilling rig's equipment, a little like seat belts are in a car." But, he added, "The BOP on Deepwater Horizon was tested only a short time before the rig exploded." There are actually three different kinds of BOPs -- pipe rams, blind rams and shear rams -- each of which use various mechanisms to remotely seal off a leaking well. The pipe ram fits tightly around the pipe to cut off flow from the outside, according to Paul Bommer, petroleum engineering professor at the University of Texas in Austin. The blind ram caps the pipe by closing completely over the top of it, and the shear ram cuts through a leaking pipe and seals the open hole. In fact, the Deepwater Horizon rig in the Gulf was outfitted with all three kinds of BOPs, according to Transocean (RIG), which owned the rig and leased it to BP (BP). Yet none of them were able to prevent the tragedy that's now fouling the Gulf with up to 60,000 barrels of oil a day. 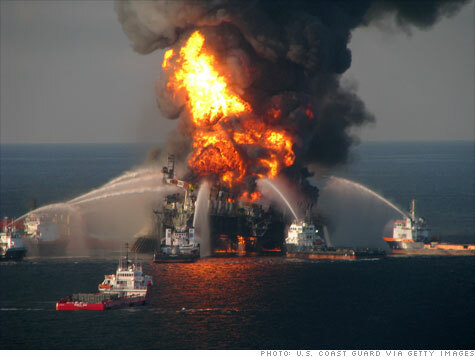 BP spokeswoman Heidi Feick declined to say whether the BOPs on the Deepwater were at fault, noting that the accident is still under investigation. Just like the BOPs on the Deepwater Horizon, the blowout preventer used in Pennsylvania by contractor C.C. Forbes had been tested shortly before the blowout occurred. "[The BOP in Pennsylvania] was supposedly tested the morning before the accident," said Pennsylvania Dept. of Environmental Protection spokesman Tom Rathbun. He said he didn't know which company had manufactured that particular BOP, and that the cause of the accident was under investigation. Hard data about the reliability of blowout preventers is hard to come by. But back in 2002, West Engineering conducted a test of seven BOPs "at the most demanding conditions to be expected." Five were successful in sealing the pipes, but two failed. The study concluded that the data "paints a grim picture of the probability of success." Still, BOP failures are relatively rare, considering how many of the machines there are. The biggest manufacturer of them, Cameron International (CAM, Fortune 500), made the Deepwater's BOPs. The outfit has more than 2,500 BOPs in operation worldwide, including 400 offshore, according to Congressional testimony from Cameron Chief Executive Jack Moore. Moore said in his testimony that the Deepwater's BOPs were built in 2001, and that they typically last 20 to 30 years "if properly maintained and used in the environment in which they are designed for." Cameron claims about 90% of the market for BOPs, estimated to be worth about $1.5 billion according to Richard Spears, vice president for oil market research company Spears & Associates. Competitors include National Oil Well Varco (NOV, Fortune 500) and GE (GE, Fortune 500)-owned Hydril. There is plenty of speculation as to why the BOPs on the Deepwater Horizon failed to prevent a deadly blowout, and the investigation is ongoing. But one thing is fairly certain. The Gulf oil spill will probably result in a "re-design" of BOPs, said UT's Bommer, as well as an overhaul of how they're tested and activated.